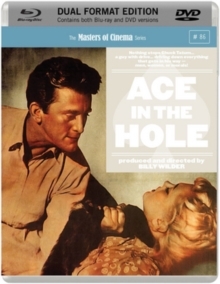 Billy Wilder directs and produces this classic film noir starring Kirk Douglas and Jan Sterling. Chuck Tatum (Douglas) is an ambitious journalist formerly of the big city who finds himself working for a small local newspaper in Albuquerque, New Mexico, after being fired from eleven previous jobs. When he hears that a man has become trapped in a cave nearby he seeks out the story with a justification that it has human interest. Realising that this may be the biggest story he's ever going to write, he manipulates the rescue workers into changing their plan so as to prolong the drama for as long as possible. He then finds an unlikely ally in the victim's wife, Lorraine (Sterling), as she reveals she no longer loves her husband and wants to get out of the marriage. As hours turn into days with the rescue attempt failing, Chuck begins to wonder if this time he has gone too far for a story.